The South Asian Association for Regional Cooperation is more relevant than ever before. Time to give it more power. The 18th summit meeting of the South Asian Association for Regional Cooperation (SAARC) is to be held in Kathmandu from November 22 to 27. Yet few people in Kathmandu appear to even be aware of the event, let alone evincing any enthusiasm about it. The lack of interest is widely shared. 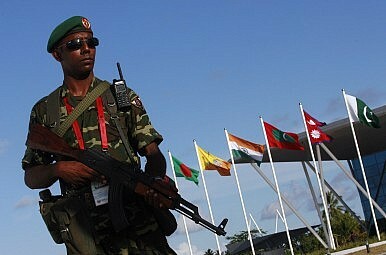 SAARC has just not been able to bring the countries of the South Asian region closer together in any substantial way. While their heads of state get together every once in a while, there is no significant two-way flow of ideas, resources, trade or people between any two countries in the region, let alone among all SAARC member states. Like other regional associations, SAARC was created to enhance regional cooperation so that, thus united, the region as a whole would be able to solve problems that were beyond the capabilities of individual member states. There are scores of issues that require just such a joint, region-wide approach. This was true in 1985, the year in which SAARC was conceived, and it is even more true today. The world is far more interconnected than it was in 1985, for better and for worse. Now more than ever, borders are slowly being rendered obsolete as resources, people, and perhaps most crucially, information flows on an unprecedented scale. Some of these flows, left to their own devices, have the potential to dramatically enhance well-being. Others threaten to produce disastrous consequences. The speed with which they move puts them beyond the control of any single nation state. Take the growth of the murderous philosophy of the Islamic State; even the United States has admitted that it was surprised by the rapidity with which the group has emerged. Clearly, leveraging or controlling these flows requires a regional approach to problem solving. Today the Islamic State has begun to attract jihadis from all over the world, including many from South Asia. A third of all Muslims worldwide live in South Asia, so it should come as no surprise that a radical few would find their way to the battlegrounds of Iraq and Syria. But the authorities should nonetheless be very concerned as to what will happen when those that survive return. How will the countries of South Asia, infrastructure-poor and delineated by long and often porous borders, keep track of them? Indeed, unnecessarily tight border controls themselves is symptomatic of the true ailment facing the region: a lack of adequate information. Stringent border controls may serve to filter out “bad” flows some of the time, but they cannot be effective all of the time – the resources simply don’t exist. Strict border controls apparently have not stopped Bangladeshi migrants from entering India in droves. Rather than invest in such ineffective measures, surely it would be more productive in the long run for the countries of the region to create a joint mechanism for tracking flows of suspicious people into and out of the region? Jihad is not the only source of havoc. India’s northwestern state of Punjab was originally a transit point for the shipment of narcotics, particularly heroin, throughout the country and beyond. Today, it has become a significant consumer of drugs itself. Clearly, stringent border controls or not, Afghan heroin has been finding its way via Pakistan into northwestern India. At the national level, illicit drug use correlates fairly closely with prosperity, so we ought to expect drug use in India to rise as its middle class becomes more affluent. That makes it all the more necessary for the countries in the region to pool their resources to better understand how the flows of drugs and their couriers are taking place. Significantly for India, its eastern states also border another heroin producing country: Myanmar. Because of the difficult terrain and the presence of guerillas, it is even more difficult for India to patrol its eastern border constantly. But if stringent border patrols are only partially effective in curtailing the flow of things with “bad” consequences, it actively discourages flows with “good” consequences. Harsh patrolling deters trade and the movement of ordinary people from place to place. Both of these flows could help the economies of countries on both sides of the border grow. After all both of these normal flows are the result of shortages of goods or people. Nepal and India are supposed to share an open border, but harassment of people moving to and from these countries still occurs, particularly on the Indian side. Again, if the countries had the ability to rapidly access and share information about the movement of people and goods, the need for such rigorous patrolling of the border would diminish. Resources could be deployed more effectively to places where its presence was actually necessary. Without impediment, relations between people on opposite sides of the border – economic, social and cultural – could flourish. In recent years, South Asian heads of state have tried to transform SAARC from a marginal player into a proactive force within the region. The formation of South Asian University, and the introduction of free trade regimes like SAFTA and SAPTA are example initiatives. Recently, SAARC members have agreed on the need to open a regional bank. While all of these are important steps in achieving regional cooperation, they won’t get very far if there is, as is the case today, a trust deficit among the countries. Member countries are not willing to be fair or open with one another. Trade and cooperation can only really occur in an atmosphere of trust, which in turn cannot be created overnight. Sharing information about issues that concern the region is one way SAARC members could begin to bridge this trust deficit. Once cooperation on this crucial but neglected area begins, it could facilitate cooperation in other areas. Equally importantly, South Asian countries need to trust SAARC. They need to appreciate that they have created an institution that could truly lead to wider cooperation between member states and that, by marginalizing it, they only hurt themselves. Thankfully, Narendra Modi, India’s prime minister and easily the most powerful politician in the South Asian region, appears to understand the need to strengthen SAARC. How effective the organization proves to be in the coming years will very much depend on how much power Modi is really willing to allocate to it. Manish Gyawali is a graduate of Miami University and Kathmandu University. He is a consultant and writer. The Struggle for the Indo-Pacific: In Search of Shangri-LaLife In Aerocity: Finding India’s Place in the New Strategic ContextThe Myth of India’s Non-Aligned BoycottReviving the India-Indonesia RelationshipBRICS, BIMSTEC, and Anti-Terrorism: What Did India Accomplish?